Edit: I changed the title from “Fancy but easy recipes on the storecupboard challenge” as I really do think these recipes are delicious, even if they’re more expensive than some of my staple meals. On the third day of the store cupboard challenge I had some yellow-stickered pears, lettuce, cheese and cod that needed using up, and some bargain new potatoes from Aldi that I didn’t want to waste. For breakfast, I was back on porridge with chopped bananas, now we actually had some bananas in the house. Today I decided to push the boat out with some more extravagant recipes, after the frugal day before with Mumma Jack’s Best Ever Chilli. My husband took the remaining portion of chilli with some rice as a packed lunch. For my lunch, I adapted an easy recipe from Delicious Magazine to make a slightly more diet-friendly version accompanied by brown rice, rather than puff pastry (but if you do fancy puff pastry, this is a great way to eat it). I didn’t have anything as exotic as macadamia nuts, so I used some walnut pieces left over from making coffee and walnut cake for my husband’s birthday. 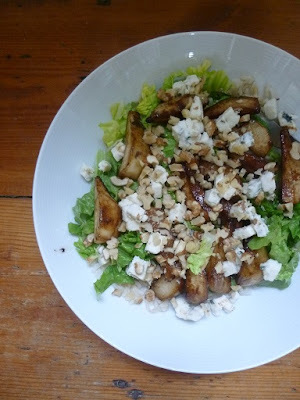 The recipe was a really tasty way of using yellow-stickered pears, dolcelatte and romaine hearts, coupled with the walnuts, balsamic vinegar and rice from my storecupboard, and cost 95p. Peel 2 pears and cut into wedges. Melt 10g butter with a tablespoon of balsamic vinegar in a frying pan. Add the pears and cook them for a couple of minutes on each side until they look brown and caramelised. Meanwhile chop up some lettuce (I used about half a romaine lettuce, the original recipe recommends rocket), 20g walnuts and 30g dolcelatte or other blue cheese. Arrange the lettuce or rocket in a bowl, spoon in the pears and sprinkle the walnuts and cheese on top. I added 100g of the cooked brown rice from last night’s chilli to help fill me up, and ta dah, fancy lunch. 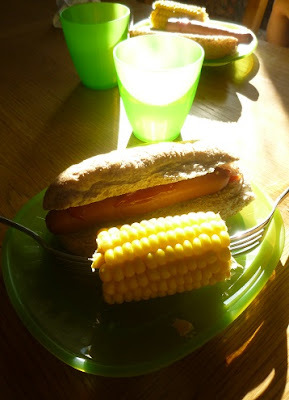 In the evening, the children ate hot dogs made from frankfurters and wholemeal finger rolls resurrected from the freezer and liberally doused with ketchup, plus some of the yellow-stickered corn on the cob bought from the Co-op. I calculate it came to 83p each, ignoring any extra corn on the cob my husband and I snaffled. Later on I tried a recipe card I’d picked up at Morrisons a few weeks ago, in search of inspiration about a packet of cut-price cod hiding in the bottom of the freezer. The Morrisons recipe card is remarkably similar to a recipe on the BBC website, and I made a few tweaks anyway, so I written out my version. 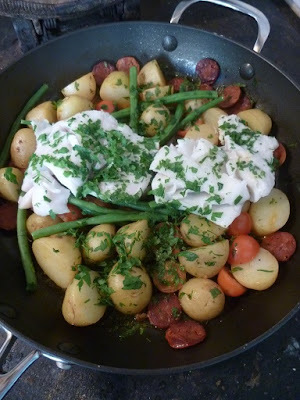 This was hardly a budget recipe as it cost £4.50 for two, so £2.25 a head, even with the benefit of yellow-stickered fish, Aldi chorizo and Aldi Super Six jersey royal potatoes at just 49p for 500g. However it tasted fabulous, was very easy and only used one pan, so I look forward to cooking it again some time. Tasted fabulous despite the over-cooked fish. 2 white fish fillets. I used 220g cod, one recipe suggests 2 x 280g haddock, which seems like an awful lot of fish to me. Don’t see why it wouldn’t work with pollack, which is often the white fish in value range bags of frozen white fish. Heat the oil in a frying pan, add the chorizo and fry for a couple of minutes until it starts to release its oil. The add the potatoes, water and 4 tbsps of the wine. Put a lid on the pan, and leave it to cook on a medium heat for 15 minutes. Next add the cherry tomatoes, green beans and remaining 2 tbsps of wine. Put the fish on top, with a sprinkle of chopped parsley, then replace the lid. The Morrisons recipe suggests cooking for a further 11-12 minutes, but I think my smaller amount of fish was more than well done by then. If I tried the recipe again, I’d cook it for an extra 8 minutes or so. Scatter with some extra parsley and eat with immense enjoyment. The Live Below the Line campaign continues until 30 June, if you might consider supporting my previous efforts to feed myself on £1 a day for 5 days from 26 to 30 April by donating to Unicef, the world’s leading organisation for children.